Citing outlandish statistics on wild horse overpopulation that have no basis in fact, and claiming to be protecting his state from a Bundy type incident, Governor Gary Herbert, in an article in Utah Policy, is proposing that his state take over the management of the wild horses and burros in Utah and kill them all, or most of them, so that the good cattle ranching folks of Utah won’t have to be besieged by the hords of overpopulating wild mustangs and burros that, according to Herbert, are coming out of the walls all over Utah. 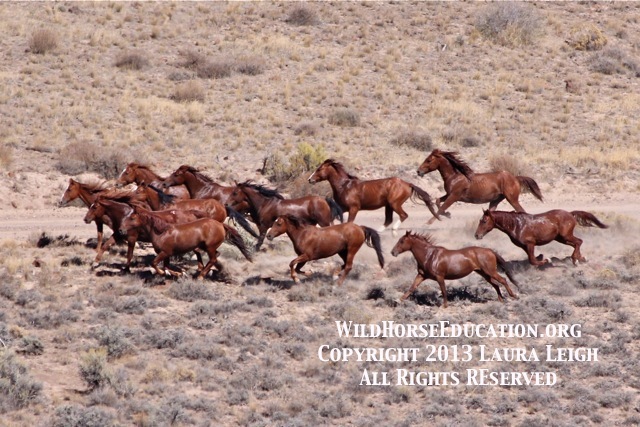 Wild horse and burro advocates know that the reverse is actually the case: Wild horses and burros are in possibly a terminal decline throughout the West, and range overgrazing in almost all cases is caused by an excess of cattle on public land not an excess of wild horses. Herbert decried the fact that some ranchers are being told they can no longer run cattle on federal lands, or are having to reduce the number of cattle they historically have grazed on those lands. He claims this is often because of drought and overpopulation of wild horses, but never faces up to the real issue that ranchers are overgrazing public lands with too many cattle and in some cases without applicable federal permits, and that governor, is a violation of the law, pure and simple, just like Bundy. 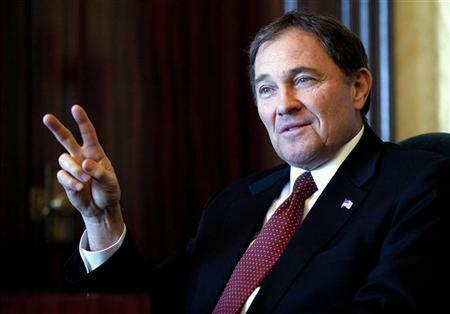 Herbert’s solution to this issue is to throw federal law out the window, cast the fate of these federally protected animals to the wind, and steal public land for the exclusive use of Utah cattlemen. The good governor also wants to cut through the red tape and open up our public lands to all the energy developing companies. Let’s see, who is paying his bills????? Easy answer governor: not a state that only wants to graze cattle and frack the environment to death, and doesn’t want the wild horses and burros to have a home there. leave the wild beauties alone….they have a right to life as we do…..who the hell do you think you are to decide to kill them?????????? power hungry, greedy mongrels! This arrogant lying greedy cattle lover refuses to face facts and should be fired for his violation of the law….the facts are too many grazing permits allocated..cattle ruin the land..its they way they eat the grass pulling it up by the roots and wallowing in the water holes…their digestive systems completely different than that of the horse and the horse is an ecological green machine but the cattle men don’t care to see this fact it sall about their own personal greed.We must get these facts out to the public and fire these political greddy idiots!Vote them out! Is this guy completely out of his mind!?!?!?!?!?!? Really, is he this ignorant? I don’t think he even understands what a decision like this will do to 80% of the American Public that want to keep the mustangs and burros wild and put an end to the BLM. If he is so worried about “Pre-Backlash” he better be aware of what could happen if he does decide to kill these peaceful animals that belong to the American public, that live on the LAND that was designated to them, not to cattle! Please make these blogs to post on FB. They could reach much more people. Reblogged this on Pass the SAFE Act!.